Souvenirs from battlefields the world over can be found in our Division of Political and Military History. Unique among them is a mounted German pigeon. His name is Kaiser, and his story is unique in the annals of military homing pigeon history. He would become one of the longest-held prisoners of war in American history and one of the longest-living pigeons ever bred in captivity. But how did a German war bird come to "live" at the National Museum of American History? After he died in 1949, Kaiser's remains came to the Smithsonian. He's not the only military pigeon in our collection. Kaiser's story begins in Koblenz, Germany, in the first week of February 1917. There, in Hans Zimmerman’s loft, a young pigeon (or "squeaker") hatched. When he was just five days old, a small aluminum identification band was placed on his left leg, bearing the Imperial German crown and marked 17-0350-47 (17 indicated the year of birth). After six weeks, Zimmerman turned this young pigeon over to representatives of the Imperial German Army. In the Great War, pigeons proved essential in trench warfare. Massed artillery fire caused more casualties than any other weapon, and communication between the forces in the trenches and those in the rear areas was essential to avoiding friendly casualties. Artillery fire could cut communication wires and prevent human runners from bringing messages to the rear echelons, but homing pigeons were a low-technology solution, operating swiftly despite bombardments, dust, smoke, and bad weather. 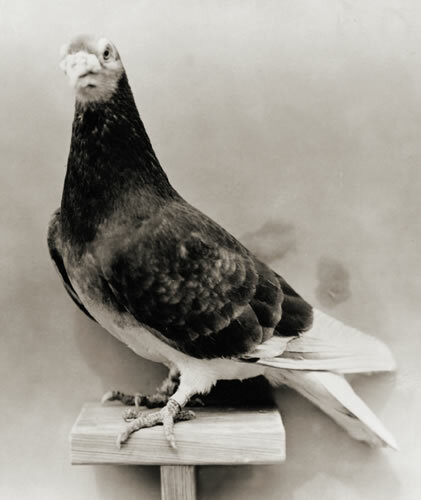 After months of training as a homing pigeon, the bird that would one day be known as "Kaiser" entered frontline service and began flying messages for Kaiser Wilhelm II's German troops in Northern France. In April 1917, just as Kaiser entered the German Army, the United States declared war on Germany. Shortly after entering the war, the U.S. Army Signal Corps decided it too needed a force of homing pigeons. By March 1918, the Signal Corps' Pigeon Service commenced operations in France. When General John J. Pershing and the American Expeditionary Forces launched the massive Meuse-Argonne Offensive on September 26, 442 American pigeons served the doughboys advancing against the German lines. During the fighting in October, American troops captured German prisoners and equipment—including pigeons. Men of the 28th Infantry Division, fighting in the Argonne Forest, captured a German trench line. Among the enemy equipment the Americans seized was a German pigeon basket with 10 pigeons, including young Kaiser. When the war ended less than a month later on November 11, 1918, Kaiser remained confined to a pigeon loft with his captured colleagues, his fate undetermined. Capturing pigeons, in addition to other equipment, was not uncommon. This image is from the U.S. National Archives. 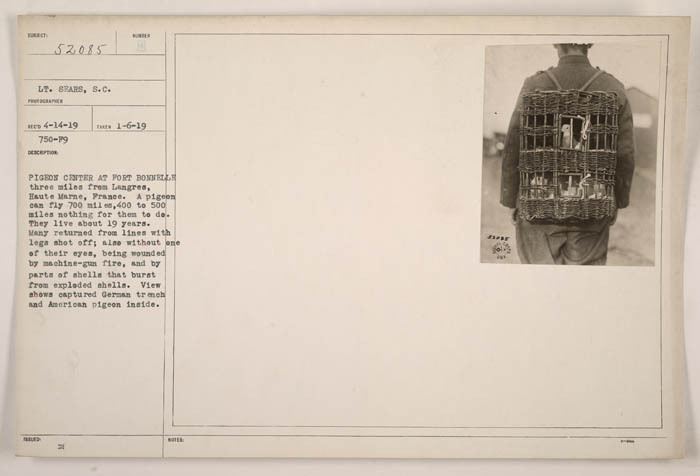 In December, the Signal Corps decided to bring home distinguished American pigeons together with captured German birds for public relations and morale purposes. On July 17, 1919, Kaiser and 21 other captured German birds arrived in the United States aboard the transport ship USS F.J. Luckenbach. Once in America, Kaiser was paraded with other captured birds and used for recruiting purposes in 1919 before settling in at the Signal Corps Pigeon Center in Fort Monmouth, New Jersey. 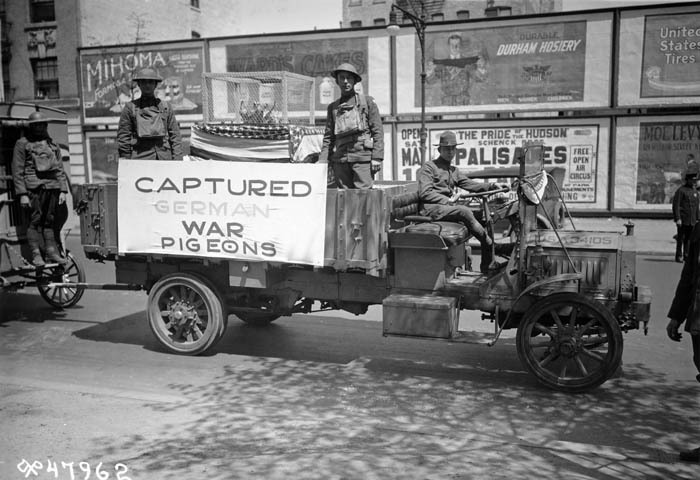 In this image from the U.S. National Archives, captured German war pigeons are on parade with military personnel. Although still a prisoner of war, Kaiser found life comfortable. In addition to free room and board, he received the name "Kaiser" from his American captors and found a mate. Kaiser became a breeding bird and began supplying squeakers for the U.S. Army. 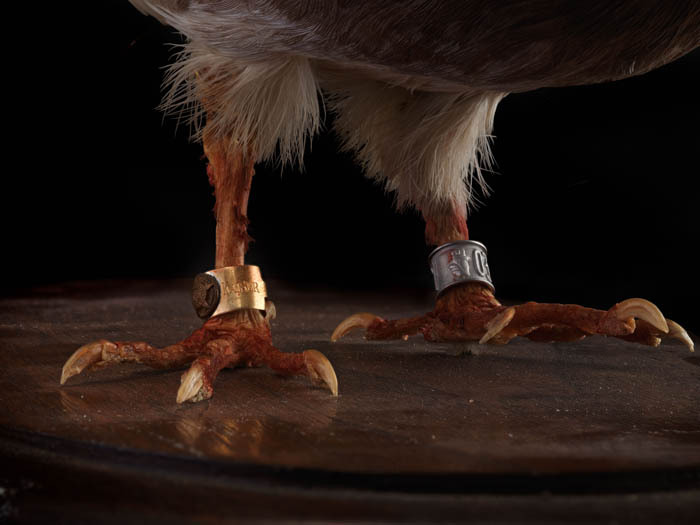 By the 1930s, Kaiser was the last surviving captured German pigeon in American custody and, despite his age, his offspring proved champion racers. 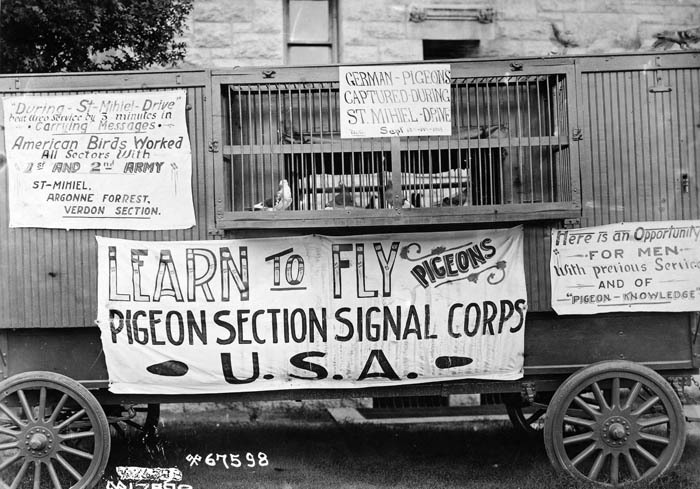 In this photo from the U.S. National Archives, "men with previous service" and "pigeon knowledge" are encouraged to learn to fly pigeons for the pigeon section of the Signal Corps. After American entry into World War II, Kaiser's offspring headed to war in Europe and the Pacific, while their father moved to Camp Crowder, Missouri, home to the U.S. Army's Pigeon Breeding and Training Center. By 1945, Kaiser had sired over 75 birds for the army, living in his own special white loft with his latest mate, Lady Belle. As a special concession for his age, the army equipped the loft with an electric heater to make cold nights cozier for Kaiser and Lady Belle. Postwar, the army shipped Kaiser back to Fort Monmouth to live out his semi-retirement from active service. On February 27, 1948, the army celebrated Kaiser's 31st birthday. The children at the fort's nursery school held a birthday party for Kaiser and made him the guest of honor. He was given membership in the American Legion's First Retread Post No. 667 in Los Angeles, California, in August 1948, on account of his service in two wars. The group created a special gold band bearing the organization's crest and engraved with "Kaiser" and "1st Retread 667" which the army placed on Kaiser's right leg. The bands on Kaiser's legs include one from the American Legion Post No. 667. Kaiser came to Washington, D.C., to celebrate the inauguration of President Harry Truman on January 20, 1949, joined by hero pigeons G.I. Joe and Jungle Joe as part of the Signal Corps' exhibition. On Halloween night 1949, Kaiser passed away at Fort Monmouth. He outlived both his namesake Kaiser Wilhelm and every other homing pigeon that served in World War I. His bloodline provided the U.S. Army with countless homing pigeons in World War II. The progeny of his great-great-great-great grandchildren, sold to the public when the army disestablished the pigeon service in 1957, remain in lofts across the United States, undoubtedly still producing racing champions. As for Kaiser himself, the Signal Corps arranged for the Smithsonian Institution to receive the old pigeon's remains after his death, for mounting and display. 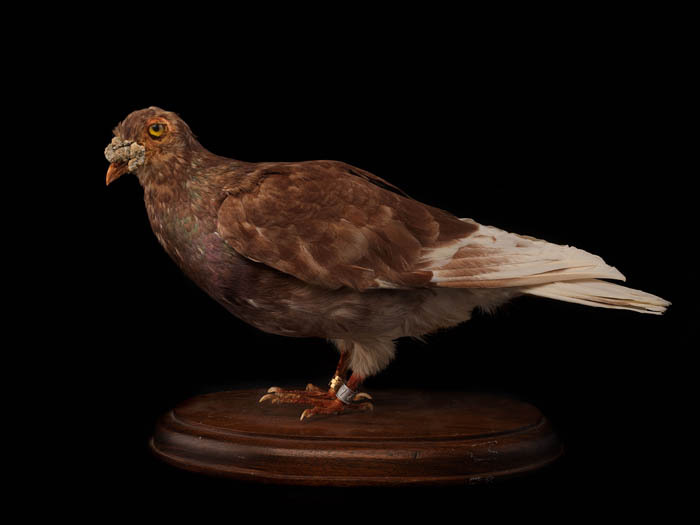 Since arriving at the museum in 1950, Kaiser has found himself in good company with three other hero pigeons: Global Girl and Anzio Boy of World War II fame, and the little British pigeon Cher Ami, a fellow veteran of the fighting in the Meuse-Argonne. In this photo from the U.S. Army, a bird identified as Kaiser perches on a post. Frank Blazich Jr. is a curator in the Division of Armed Forces History. He has also blogged about Vietnam combat photography and Senator John McCain's service. Learn more about how animals served in World War I, including slugs.